A brief look at the structure of a computer program. Computer Programming is the art of making a computer do what you want it to do. At the very simplest level it consists of issuing a sequence of commands to a computer to achieve an objective. In the Microsoft world MS DOS (and early Windows) users used to create text files with lists of commands called batch files. These simply executed the sequence of commands as a group or batch, hence the name. The files had an extension of .BAT and so were sometimes called BAT files. You can still produce these in Windows environments today but in practice they are rarely seen. If the file were called SAVE.BAT then at the end of each day I could simply type SAVE at a DOS prompt and the files would be saved and backups deleted. This is a program. Note: Users of Linux or other operating systems, including modern versions of Windows, have their own versions of these files often known as shell scripts. These shell scripts are much more powerful than DOS BAT files, and support most of the programming techniques that we will be discussing in this course. If you were a little daunted by that, please don't be. A computer program is simply a set of instructions to tell a computer how to perform a particular task. It's rather like a recipe: a set of instructions to tell a cook how to make a particular dish. It describes the ingredients (the data) and the sequence of steps (the process) needed to convert the ingredients into a cake or whatever. Programs are very similar in concept. Just as you speak to a friend in a language so you 'speak' to the computer in a language. The only language that the computer understands is called binary and there are several different dialects of it - which is why that cool MacOS program won't run on your Windows PC and vice versa. Binary is unfortunately very difficult for humans to read or write so we have to use an intermediate language and get it translated into binary for us. This is rather like watching the American and Russian presidents talking at a summit meeting - One speaks in English, then an interpreter repeats what has been said in Russian. The other replies in Russian and the interpreter again repeats the sentence, this time in English. Oddly enough the thing that translates our intermediate language into binary is also called an interpreter. And just as you usually need a different interpreter to translate English into Russian than you do to translate Arabic into Russian so you need a different computer interpreter to translate Python into binary from the one that translates VBScript into binary. The very first programmers actually had to enter the binary codes themselves, this is known as machine code programming and is incredibly difficult. The next stage was to create a translator that simply converted English equivalents of the binary codes into binary so that instead of having to remember that the code 001273 05 04 meant add 5 to 4, programmers could now write ADD 5 4. This very simple improvement made life much simpler and these systems of codes were really the first programming languages, one for each type of computer. They were known as assembler languages and Assembler programming is still used for a few specialized programming tasks today. Even this was very primitive and still told the computer what to do at the hardware level - move data from this memory location to that memory location, add this byte to that byte etc. (Binary data is represented as a stream of binary digits or bits, and for convenience these are grouped into sets of eight which are called bytes or occasionally octets. Bytes traditionally were used to represent the characters of text, one byte per letter.) Programming this way was still very difficult and took a lot of programming effort to achieve even simple tasks. Gradually computer scientists developed higher level computer languages to make the job easier. This was just as well because at the same time users were inventing ever more complex problems for computers to solve! This competition between the computer scientists and the users is still going on and new languages keep on appearing. This makes programming interesting but also makes it important that as a programmer you understand the concepts of programming as well as the pragmatics of doing it in one particular language. I'll discuss some of those common concepts next, but we will keep coming back to them as we go through the course. Here the program flows from one step to the next in strict sequence. Here the program reaches a decision point and if the result of the test is true then the program performs the instructions in Path 1 , and if false it performs the actions in Path 2 . 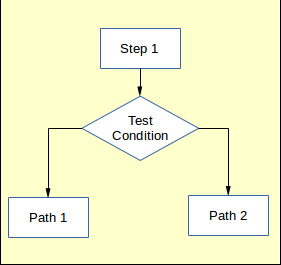 This is also known as a conditional construct because the program flow is dependent on the result of a test condition. 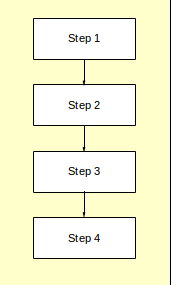 In this construct the program steps are repeated continuously until some test condition is reached, at which point control then flows past the loop into the next piece of program logic. Here the program performs an identical sequence of actions several times. 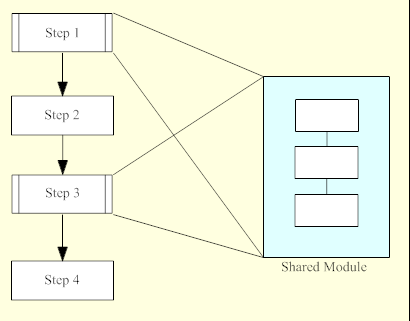 For convenience these common actions are placed in a module, which is a kind of mini-program which can be executed from within the main program. Other names for such a module are: sub-routine, procedure or function. Operations (add, subtract, compare etc. Once you understand those concepts and how a particular programming language implements them then you can write a program in that language. We already said that programming was the art of making a computer do what you want, but what is a program? In fact there are two distinct concepts of a program. The first is the one perceived by the user - an executable file that is installed and can be run repeatedly to perform a task. For example users speak of running their "word processor program". The other concept is the program as seen by the programmer, this is the set of textual instructions to the computer, written in some programming language, that can be translated into an executable file. So when you talk about a program always be clear about which concept you mean. Basically a programmer writes a program in a high level language which is interpreted into the bytes that the computer understands. In technical speak the programmer generates source code and the interpreter generates object code. Sometimes object code has other names like: P-Code, Byte code, binary code or machine code. The translator has a couple of names, one being the interpreter and the other being the compiler. These terms actually refer to two different techniques of generating object code from source code. It used to be the case that compilers produced object code that could be run on its own (an executable file - another term) whereas an interpreter had to be present to run its program as it went along. The difference between these terms is now blurring however since some compilers now require interpreters to be present to do a final conversion and some interpreters simply compile their source code into temporary object code and then execute it. From our perspective it makes no real difference, we write source code and use a tool to allow the computer to read, translate and execute it. A loader - every program needs to be loaded into memory by the operating system. The loader does this and is usually created by the interpreter for you. Data definitions - most programs operate on data and somewhere in the source code we need to define exactly what type of data we will be working with. Different languages do this very differently. Statements - these are the core of your program. The statements actually manipulate the data we define and do the calculations, print the output etc. That is, the program will typically start off by setting its internal state, perhaps setting totals to zero, opening the needed files etc. Once it is ready to start work it will read data either from the user by displaying prompts on a screen or from a data file. Most commonly a combination is used whereby the user provides the name of the data file and the real data is read from the file. Then the program does the actual data processing involving math or data conversion or whatever. Finally the results are produced, either to a screen display or, perhaps, by writing them back to a file. All the programs we write in the early parts of this tutorial will be batch style programs. Most systems with a Graphical User Interface or GUI (eg. Microsoft Windows or Android) as well as embedded control systems - like your Microwave, camera etc. are event driven. That is the operating system sends events to the program and the program responds to these as they arrive. Events can include things a user does - like clicking the mouse or pressing a key - or things that the system itself does like updating the clock or refreshing the screen. In this configuration the program again starts off by setting up its internal state, but then control is handed off to the event loop - which is usually provided by the operating environment (sometimes referred to as the runtime). The program then waits for the event loop to detect user actions which it translates to events. These events are sent to the program to deal with one at a time. Eventually the user will perform an action that terminates the program, at which point an Exit Event will be created and sent to the program. We look at event loops and event driven programming in the "Advanced Topics" section and again in the GUI programming topic.